Coming from San Francisco : Take 80 East. Be in the right lane as you approach Sacramento. Watch for the Reno 80 East Exit. Stay on 80 East until the first Roseville exit - Riverside Blvd. it only goes one direction, it will become Vernon St. as it makes a right hand curve. We are six blocks down, on the right side at the corner of Lincoln and Vernon. Take a Right on Lincoln and the entrance is the first door on the right. This is the only block of two story buildings. Coming from Pleasanton : Take 680 North to 80 East. Be in the right lane as you approach Sacramento. Watch for the Reno 80 East Exit. Stay on 80 East until the first Roseville exit - Riverside Blvd. it only goes one direction, it will become Vernon St. as it makes a right hand curve. We are six blocks down, on the right side at the corner of Lincoln and Vernon. Take a Right on Lincoln and the entrance is the first door on the right. This is the only block of two story buildings. Coming from Stockton/Fresno : Take 99 North to Sacramento. Merge onto 80 East. Stay on 80 East until the first Roseville exit - Riverside Blvd. it only goes one direction, it will become Vernon St. as it makes a right hand curve. We are six blocks down, on the right side at the corner of Lincoln and Vernon. Take a Right on Lincoln and the entrance is the first door on the right. This is the only block of two story buildings. Coming from Yuba City : Take 65 to 80 West. Take the first Roseville exit - Atlantic St. it only goes one direction, it will become Vernon St. as it goes through a S curve. Once you approach Lincoln st. There will be a stop light. Take a left at the light. The entrance is the first door on the right on Lincoln. This is the only block of two story Buildings. Coming from Sacramento : Take 80 East, To the first Roseville exit - Riverside Blvd. it only goes one direction, it will become Vernon St. as it makes a right hand curve. We are six blocks down, on the right side at the corner of Lincoln and Vernon. Take a Right on Lincoln and the entrance is the first door on the right. This is the only block of two story buildings. Coming from Auburn : Take 80 West, to the first Roseville exit - Atlantic St. it only goes one direction, it will become Vernon St. as it goes through a S curve. Once you approach Lincoln st. There will be a stop light. Take a left at the light. The entrance is the first door on the right on Lincoln. This is the only block of two story Buildings. Coming from Citrus Heights : Take San Juan Blvd, it will become Sylvain, then Auburn Blvd. Then Riverside Blvd. As it goes over hwy. 80 Then, Vernon St. as it makes a right hand curve. We are six blocks down, on the right side at the corner of Lincoln and Vernon. Take a Right on Lincoln and the entrance is the first door on the right. This is the only block of two story buildings. Coming from Sunrise Mall: Take Sunrise all the way to Douglas and go left, that will take you over hwy 80, Douglas ends at Vernon St. make a very sharp Right, We are six blocks down, on the right side at the corner of Lincoln and Vernon. Take a Right on Lincoln and the entrance is the first door on the right. This is the only block of two story buildings. Coming from the Galleria : Take Galleria Blvd over the railroad tracks and make a right At Wells Rd. and a left on Atlanti , it will become Vernon St. as it goes through a S curve. Once you approach Lincoln st. There will be a stop light. Take a left at the light. The entrance is the first door on the right on Lincoln. This is the only block of two story Buildings. Coming from Hwy 65 : Hwy. 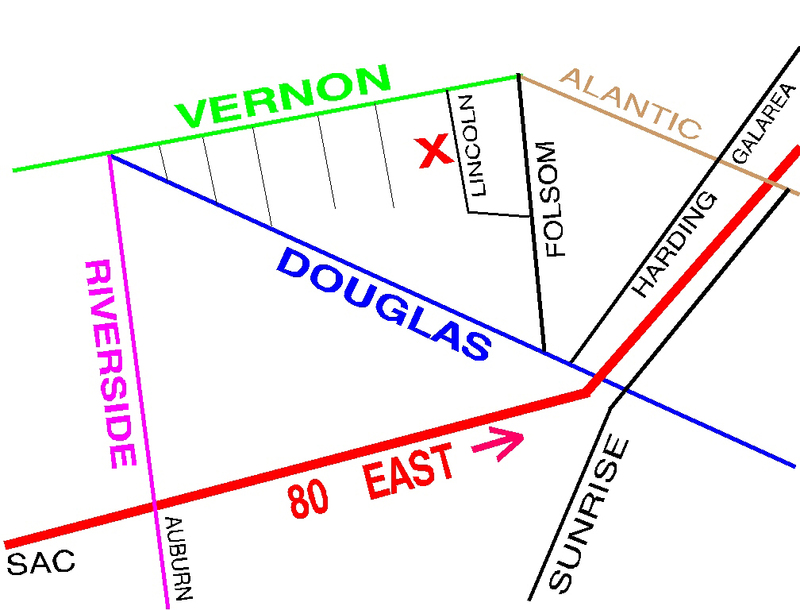 65 to 80 West, ¼ mile to the first Roseville exit - Atlantic St. it only goes one direction, it will become Vernon St. as it goes through a S curve. Once you approach Lincoln st. There will be a stop light. Take a left at the light. The entrance is the first door on the right on Lincoln. This is the only block of two story Buildings.